Did you know that it has been more than 40 years since the first phone call was made? Cooper used that special moment to call none other than his chief rival, Dr. Engel, the research chief of Bell Labs, a company in close ties with AT&T at the time. It was a victory for Motorola, and Cooper personally, who is now known as the creator of the cellular telephone. And even though that device would look hideous by today's standards, it was still the originator of today's iPhones and Galaxies. One thing that we can really thank the technology progress, though, is the decline in prices since then - the DynaTAC cost a whopping $3500 at the time. Interestingly, cellular technology as a whole was actively being developed back in the days of WWII (the 1940's), but it wasn't until the 70's until it started becoming widely commercial. And even though that first break-through phone call was placed in 1973, it was not until the late 70's that the mass adoption of cell phones started. Curiously enough, the first big cell phone network was established in 1979 in Tokyo, Japan, covering the Japanese metropolitan with 23 base stations. Soon after, in 1981, the Scandinavian countries followed suit, launching the first roaming network across Sweden, Denmark, Norway and Finland (hey, that's where Nokia comes from! ), of course. Cell phones started arriving en masse into the United States a whole 10 years after Dr. Cooper placed the historic first phone - only in 1983, the metropolitan Chicago area opened its cell network to customers and kicked off an era of mobile in the United States. The US, however, long played catch-up. In fact, Finland was the place where mobile innovation flourished in following years: that's where the first 2G network was launched, after all. Finland also scored innovation in many other aspects of mobile tech: text messaging (started in 1993), ringtones (1998, Finland) and widely-spread mobile Internet service (1999, Japan). Jumping so quickly through history brings us to modern times with the coming of 3G networks in 2001. 3G was a hugely important technology that most countries are still relying on for mobile data - the HSPA protocol made for fast data transfers, but it was also compatible with the previous generation of networks. That's how it all started back in the years, bringing us today's cell phones with 4G LTE connectivity that often outpaces that of your home Internet (but boy, do those data limits still hurt) and with phones that can communicate with satellites, nailing our location with great precision. What will the future bring? The times of net neutrality and the very essence of the Internet and mobile is challenged every day, so only time can tell, but in the meantime, we can take action to prevent those freedoms, and hope for the next big thing in technology. [Apple will now want to buy the graves of those awesome people to patent phones and sue Samsung.] Chill haters, that is a joke. This year Martin Cooper was in my country in "Login 2014" conference:http://www.youtube.com/watch?v=ZtJrbsomi70 In my opinion Martin Cooper should get more attention than Steve Jobs. Martin Cooper is a real visionist and inventor while Steve Jobs was just a good markeding specialist and today Steve Jobs is just a Apple promotional face. http://en.wikipedia.org/wiki/Personal_computer Are you posting from your calculator broski? You can thank Steve Jobs for your personal computer. You are drunk or high on drugs? I don't drink alcohol and the last time I did drugs (weed) was almost 20 years ago. Thanks for the concern though. Yeah, that's not really historically accurate. Jobs and his work at Apple made computers affordable and accessible to the average person, and still is a big influence in how we use computers and smartphones today. I don't really want to say anything negative about Martin Cooper, but if he hadn't made the first cellular phone call, someone else would have soon after. PAU is posting from his abacus. He doesn't use personal computers. Nor Apple invented computer. Nor Apple made first personal computer. Nor Apple was first who start selling personal computers. "I don't really want to say anything negative about Martin Cooper, but if he hadn't made the first cellular phone call, someone else would have soon after." Why don't you use this logic when you are talking about Apple? I think the article title should change to 1st call ever made to a cellular phone. We all know who invented the telephone (landline) . Just saying but respect to this inventor. Respect to that guy for thinking outside the box. Everyone say "Thank you" to Motorola. lol. That Motorola died years ago, unofficially, and three years ago, officially. The minute you get bought and sold off in pieces, your history dies with you. My moto G laughs at your comment, LOL. I think Lenovo bought Motorola, is that right ? And Nokia introduced the GSM network in Europe long time ago. Woo-hoo we have a typical nokia boy here. It's not fanboysm, it's HISTORY. Woo-Hoo we have a blind basher here ! i'm pretty sure the president of finland was the 1st person to ever make a GSM call can't remember what year ! MOTOROLA can be correctly called the CREATOR of the cell phone...And a Big "THANK YOU" to Dr. Cooper, the Tech-master @ MOTOROLA...BUT, what now? Is MOTOROLA/LENOVO even coming out with a Flagship phone with terrific specs this year that can compete with LG, Samsung, HTC, or Sony? 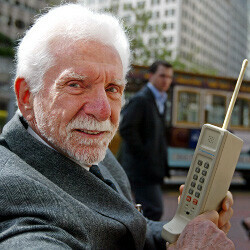 C'mon Motorola make Dr. Cooper proud...AND we'll gladly support great MOTOROLA cell phones again! So you're comparing adoption of a tech standard to invention of something like the cell phone from nothing but a person's ideas? Yeah that's exactly the same. I think everyone recalls that, we learn about it in school, but we never heard of Martin Cooper in school, and I graduated 20 years ago. Besides that, I'm guessing they would've said over 100 years ago, not 40 if they were talking about AGB. PA has yet to review a landline or even a cordless phone, when they say first call, it being a cellular one is a forgone conclusion. PA you are misleading people this was the first cell phone call and not the first phone call! Those are 2 different things, the first phone call was from Alexander Graham Bell!